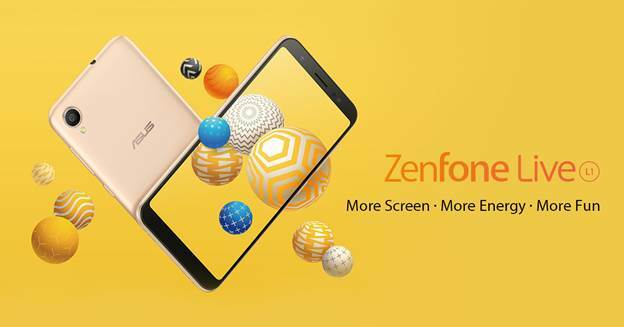 BoyRaket.com: THE CROWD FAVORITE RETURNS: ASUS PHILIPPINES ROLLS OUT THE NEW ZENFONE LIVE L1 THIS JULY! THE CROWD FAVORITE RETURNS: ASUS PHILIPPINES ROLLS OUT THE NEW ZENFONE LIVE L1 THIS JULY! The all-new ZenFone Live L1 gives users more of everything they love, in an amazingly compact and easy-to-use phone that's designed with consumers in mind. It sports an immersive full view 18:9 HD+ display, providing users with a bigger, wider, and brighter cinematic viewing. Inside is a 3,000 mAh high capacity battery that lets users binge watch all of their favorite films and TV shows as well as listen to their playlists for hours. To top it off, the ZenFone Live L1 can last for 28 days on standby! The ZenFone Live L1 also features a 13MP sharp shooting rear camera. With its super-sharp camera and 0.3 seconds focusing system, ZenFone Live L1 is always on hand to capture life's magic moments. For added convenience, the newest ZenFone is designed with a triple-slot tray, which can support up to two nano sim cards in conjunction with a microSD up to 2TB. In addition, the ZenFone Live L1 now has a special face unlock that is powered by the Qualcomm Snapdragon Neural Processor, allowing a faster and accurate unlocking. With the ZenFone Live L1, users can enjoy a device with more screen, more battery, and more fun all in a compact 5-inch body. The ZenFone Live L1 will be available nationwide on July 21, 2018 at the price of only PHP 5,995.00. For more information on the newest ZenFone Live L1, the ZenFone series, and other incredible products from ASUS, tune in to the ASUS Philippines Facebook Page and theZenTalk Philippines Forum.